Pub in Bow, very close to Devons Road Station. 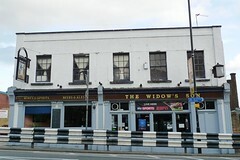 Note: The Widow's Son closed in early 2016, and reopened with new tenants later the same year. We haven't visited since the change of management, and apparently it's very different now. Our assessment of the pub pre-change can be seen on an earlier version of this page. Last edited 2017-04-16 07:35:16 (version 5; diff). List all versions. Page last edited 2017-04-16 07:35:16 (version 5).